Organized by SCMM President Michael Garcia, the run was in lieu of the Marston’s Breakfast in Valencia. 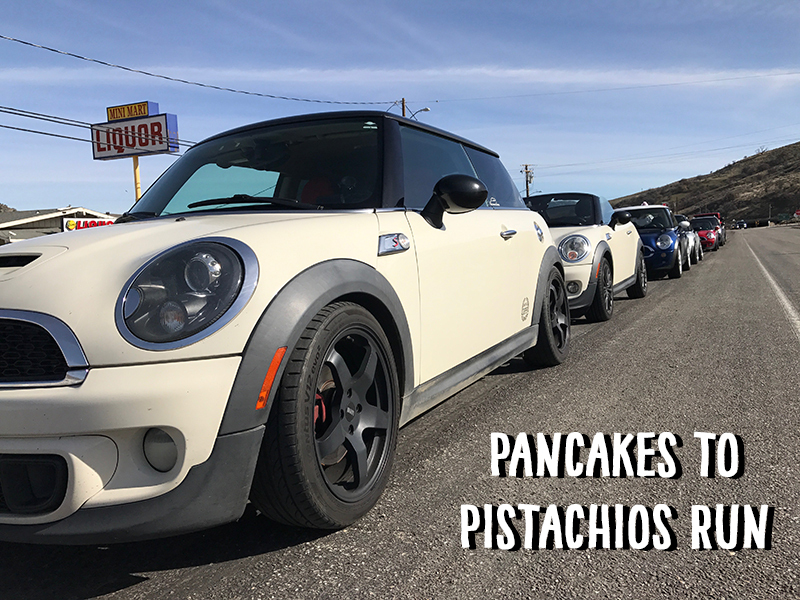 The group met at the Ranch House Restaurant in Gorman for breakfast before starting from Fraizer Park and looping Mt Pinos with a stop along the way at the Santa Barbara Pistachio Farm. The recent storms that brought rain to Southern California, also dumped snow on Mt Pinos and the area around Pine Mountain Club. There was plenty of snow along the road, but the highway itself was clear except for the fine gravel put down by CalTrans during the storm. By the time the caravan of MINIs came through, most of the gravel had been swept off to the side of the road or to the center, during the days leading up to the run. Once the group crossed the mountain it was time to visit the Santa Barbara Pistachio Farm, a favorite rest stop on Highway 33. From mild unsalted and salted to Red Hot Habanero, visitors can sample any of the nine flavors offered. After the pistachio stop it was back on the twisties for the return loop to Frazier Park via Lockwood Valley Road, and lunch at Black Coffee Draft House before calling it a day. NOTE: February’s Fourth Saturday of the Month Breakfast will be back at Marston’s Restaurant, 24011 Newhall Ranch Rd. Meet and mingle at 8 a.m., sit down to eat at 8:30 a.m.